SharedVar is designed to be middleware between different platforms or charts. SV can be used as Key/Value Storage for different type of variables. You can read & write from any platform from central location. You can exchange data between platforms and charts.Data is persistent while SharedVar Server application is running. Read & Write from any platform to a centralized database like key/value storage. This software is specially designed for Trader and Quants´ needs. You can sort your data in different Realms to keep things tidy. 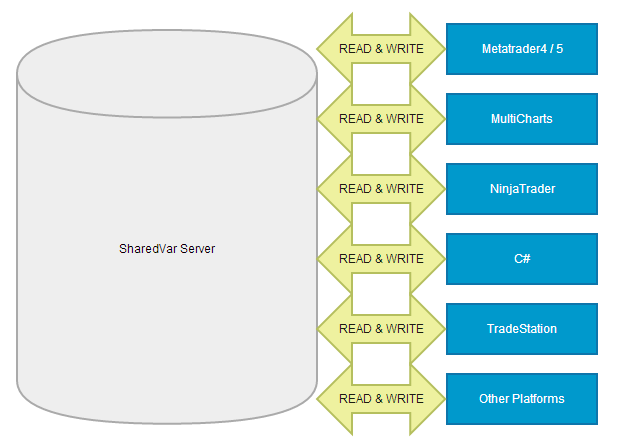 SharedVar has a server application as middleware. This application is designed to be a debugging instance at same time. You can view all variables real-time, edit & remove them manually. Keep this application running in order to work with SharedVar DLL files. Stored Key/Value pairs are persistent until SharedVar Server App has been stopped. Hint: You can call svServerRunning to determine whether Server Application is already running from any client. If it is not running use svServerStart to start it. SharedVar is FREEWARE. You can use it with unlimited number of computers or/and deploy it with other applications. In order to seperate key/value pairs into different sections you can send any variable to seperate realms. Realms are kind of table-name inside a big database. As example: you can store EURUSD Data into "EURUSD" Realm and USDJPY into "USDJPY" Realm. Realms is designed to sort your data in logical sections. ShareVar stores everything in strings in backend. For example you can store "name"=>"john" and try to read it with svGetInt("name") this will return 0 because "john" cannot be converted to integer. Lets say you use svSetString(Link,"x","923"), this can be read with svGetInteger(Link,"x") as integer or svGetDouble(Link,"x") as double. Internally there is no automatic type tracking. Everything is stored as string but converted back to requested type. This information might be important to know. We have designed SharedVar with different parameters. Use /hide to start Server hidden. Server will still start but in background. Use /systray will automatically minimize Server to systray. You cannot start server parameterized from svServerStart command. These parameters are useful by deploying or installing on client computers. Returns version of running SharedVar Server. Use this function to make sure that a specific version is required in your code. Hashing functions, they can be sometimes useful. Returns Path to last known SharedVar Server. Warning : This path will return empty if Server was never started on this computer. You need to start Server at least once manually, so svServerPath returns valid Path. Functions are used to set different type of variables in database. Integer/Double types are using svSetValue together. Under certain conditions this function might return false. It indicates an error. We recommend to check return values and re-send it. For example: SharedVar Server might be stopped from user while you try to read or write. These functions are responsible to Delete either All or Variables with given Prefix.svRemoveAll will remove all variables and svRemovePrefix will only delete variables from Realm with specific Prefix string. Sometimes you want to enumerate realms and variables in given realm and read values programmatically. Use these functions for that purphose. Returns number of currently available Variables in given Realm (through Handle). svVarName is responsible to read the name from given Index. We have prepared a demo application to test common functions of SharedVar. You can find this Application inside Resources\ folder. This is a topic for advanced developers: SharedVar-*.dll sends so called Trace debug output to Windows debugging system. You can use DebugView tool from Microsoft to capture messages sent from SharedVar-*.dll. You will probably see other messages from other applications too, you can then filter messages inside that tool to capture only from one specific application. SharedVar.mqh is inside Resources/Metatrader4 folder, you have to put it into [datafolder]\MQL4\Include\ in order to install. Importing DLL function is language specific. SharedVar is able to work with any other application same way. Consult support of your software to find out how you can import DLL functions. If you have imports from any other application, please send them to us, so we can publish. Normally every client (application) has own DLL requirements. For example Metatrader requires DLL inside [datafolder]\MQL4\Libraries, Tradestation inside [installfolder]\Program, [ProgramFiles]\TS Support\MultiChartsXX, you could put DLL files into these folders but easier: put dll files inside your main Windows folder such as c:\Windows, all clients will be able to access to SharedVar dll files. Our setup software automatically publishes 4 versions of dll into your Windows folder automatically. Theoretically you don´t need to install anything manually, but depending on client application, DLL folder might be required on different location, in such cases its good that you know about this info. SharedVar is ready to be installed on multiple computers automatically. You can check parameters for further information. All you need to do is to embed DLL and SharedVar.exe file with your products, It is not required to be installed through native installer, all files are concepted to be slim and easy to transport.